Governor Bobby Jindal’s signature on House Bill 788 gives final approval to the Ernest N. Morial Exhibition Hall Authority to begin executing bold plans for the Convention Center District Development Project that will revitalize New Orleans Ernest N. Morial Convention Center Corridor from Poydras Street to the Market Street power plant along the city’s riverfront. 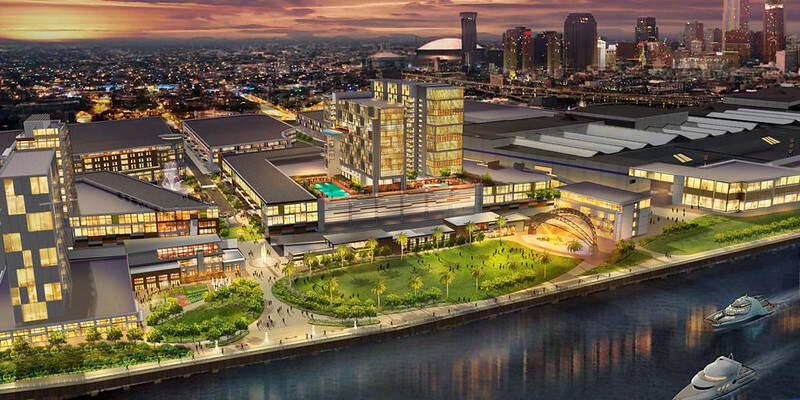 The legislation, sponsored by Representative Walter Leger of New Orleans, is designed to allow the Authority, which operates the New Orleans Convention Center, to move forward with a comprehensive plan to revitalize an important part of the city through new development on a 47 acre tract owned by the Authority, and to make significant visual and functional improvements to the area around Convention Center Boulevard. According to Representative Leger, “Leveraging public dollars in a way that requires no new taxes, or the reallocation of existing tax dollars to attract major private investment will continue the renaissance of our City, region and state.” Convention Center officials estimate that the project could entail up to $700 million in private investment, which in turn would produce thousands of new jobs and sales and occupancy tax revenues in the City’s booming hospitality industry. “With the bill becoming law, we are now free to begin exploring options to identify the right master developer to lead us through this process and generate the outside investment that will make this project one of the largest infrastructure improvements for Louisiana in recent history,” Johnson said. The Convention Center Authority, which led the efforts to expand the Center in 1991 and 1999, has been studying options for redeveloping and improving the area since mid-2012. A variety of studies have been undertaken to assess possible changes in traffic patterns to reduce congestion and improve public safety, as well as analyze current and future retail, housing and hotel needs. Central to the plans is the construction of a new “headquarters” hotel on the upriver side of the Convention Center, needed to accommodate the current demands from meetings and conventions and the projected increase in visitors to the city leading up to its 300th anniversary. Other proposed aspects of the Convention Center District Development Project include a linear park along Convention Center Boulevard, outdoor entertainment, arts and cultural venues and new retail and housing options. An added benefit of the project is its ability to provide a “relief valve” for the already stressed tourism infrastructure in the French Quarter and along Magazine Street and the Marigny/Frenchman Street areas.